I thought since it's 'spring' and all, getting to swimsuit season (and some of us have two upcoming weddings) this would be the perfect time to share this little bit of heaven. four cups of any combination of berries- I use a combination of blueberries, raspberries, blackberries, chopped strawberries. For the candied nuts, in a non stick pan over medium high heat, pour two tablespoons of sugar. When the sugar begins to caramelize, add the nuts and stir well to combine. Remove from the pan onto some foil. Chop nuts when cool. 1- In a heavy saucepan, combine cream, half the sugar and the vanilla bean. 3- When the mixture in the saucepan just comes to a boil, remove from the heat. Pour a few tablespoons of the hot mixture into the egg mixture and stir. 4- Combine both mixtures back together into the saucepan and return to low/medium heat until the mixture coats the back of a spoon. 5- I usually strain my cream to ensure there are no clumps. I've made this many times to rave reviews. It is such delicious (somewhat lighter) fare for the warmer months. This looks good, I've never heard of Creme Anglaise, but looks good! I’m working on my summer body, and weirdly it hasn’t been so bad, I’m still not ready for summer, but I also don’t feel like I’m starving, per usual. 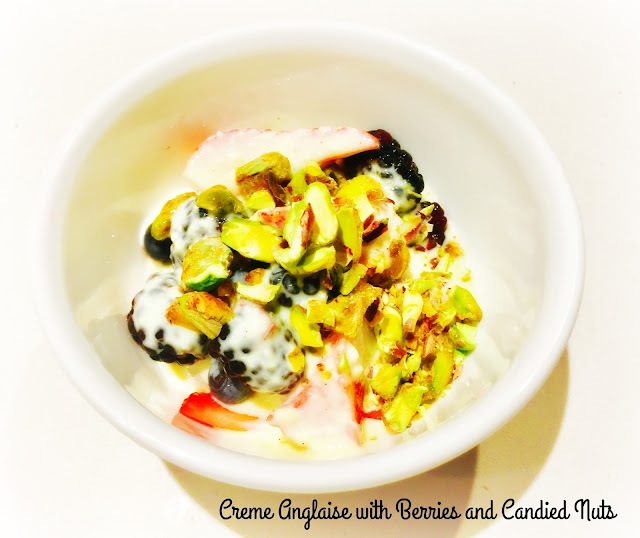 This cream Anglaise is the perfect spring time dessert. Thanks for sharing.